Honestly, that’s not me on the left. It’s just a guy who has a bunch of the same goalie equipment that I do. I have a co-worker who always calls me “Ocho.” As in ESPN the Ocho, the (unfortunately) fictional ESPN arm that shows odd sports. Yes, I love odd sports that don’t get a lot of love from the mainstream media (I would love nothing more than an Amish Rake-Fighting League, and possibly Worldwide Bicycle Jousting). Recently, I’ve uncovered a few misfit sports you need to know about. Let’s start off with Jugger. I was at Arizona Wilderness Brewing Co about a month ago, and saw a really random assemblage of characters file onto the patio. They were dressed in odd bits that looked kind of like sports jerseys, but clearly from a dimensional plane I had never visited … possibly a dystopian future in which all conventional sports clothing has disappeared along with high-quality graphic design and screen-printing techniques. I struck up a conversation, and learned that their sport – Jugger – is derived from a movie called The Salute of the Jugger (which I still need to watch, by the way). Let’s get this out of the way, though: This movie stars Joan Chen and Rutger Hauer – yes, the guy from Worst Movie Ever in Universal History candidate Hobo With a Shotgun. This is not art house stuff, friends. From where I stand, Jugger has elements of a broomless Quidditch with a measure of free-form beating-the-hell-out-of-each-other-with-foam-implements. I get the impression from the participants’ habit – lots of drinking and more smoking than is typical among athletes – that strategy rather than fitness rules the day during a rousing game of Jugger. It also seems that DIY sort of people will love crafting their “weapons” and team uniforms. Apparently, Australians and Germans really get into this. That speaks volumes, doesn’t it? Oi and ja. You still won’t look this cool fighting at a park. You might need a good eerie warehouse. And now onto one for anyone who grew up with Star Wars, even the largely miserable prequels. 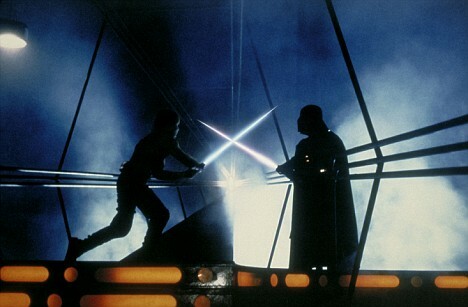 It doesn’t have an official name, but I guess you can call it lightsaber combat. I discovered a group just steps away from my house practicing in my local park; they’re called Syndicate Saber, and their enthusiasm is contagious. They do not only combat, but choreographed performances. It’s free to participate and they even have loaner sabers, but they want all participants to get their own in a reasonable amount of time. Here’s an interesting tidbit: The popularity of The Force Awakens has made many of dueling-capable lightsabers kind of scarce. Syndicate bases much of its technique on actual martial arts, too. They’ll point out elements of kendo, and I detected hints of iaido. You can work up a good sweat sparring, and you’ll can definitely work up some soreness even if you lift weights, do yoga and ride bikes regularly. The interesting thing is, though, that skill is a huge equalizer. A practiced swordsperson in less-than-Olympic fitness can hold off a far fitter specimen who lacks finesse. Now, let’s get into a new beach sport. 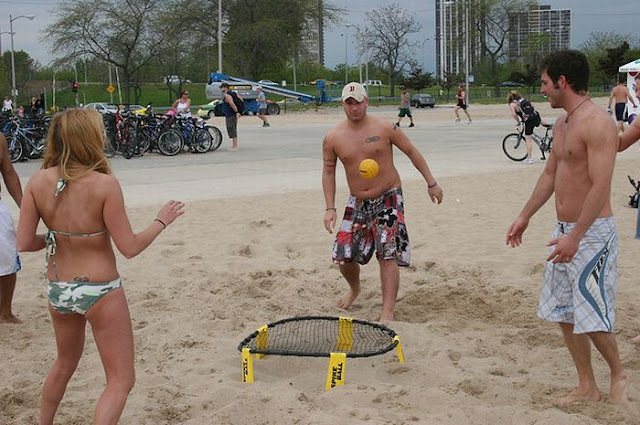 This one found me by way of the Internet rather than in-person good fortune, and it’s called Spikeball. I think of it as a small-scale volleyball that substitutes one of those little trampolines for a net. You serve into into the trampoline, it pops up, your opponents can, at most, bump, set and spike. Or bump and spike. Or something, just as long as you don’t get three more touches. It’s pretty straightforward, and should attract its share of volleyball fans. I think Jugger players (would that be Juggernauts?) would want a ball with actual spikes, and you don’t get to whack anyone with a replica lightsaber, so the Star Wars fans are likely out. Spikeball doesn’t have the cache of being affiliated with a B movie or a cinema icon. It comes across as the by-necessity offspring of a bunch of dudes who went to party on the beach, decided they wanted to play volleyball, realized they didn’t have the gear, and just rooted around in the back of the station wagon they borrowed from Mom until they found enough stuff to keep themselves occupied … and then took the idea to Shark Tank. Hey, necessity is the mother of invention. And Spikeball doesn’t take up nearly as much room as a volleyball court. Have I missed your favorite odd sport? Clue me in with a description and some links!